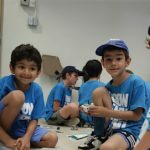 Lego Classic Builder – Junior Leader is an engineering and building program which allows younger students (kindergarten to grade 2) to design and build various stable and functioning structures in anticipation to building into Robotics. Students will build different interesting projects each week as well as learning different components and building blocks. Programming includes daily competitions for creativity, and design and students work in various roles to build team collaboration and excitement. At the end of every building project, each student will present their work to their classmates and get the opportunity to show them how their structure works, what they did to make it more stable and what its purpose is (transportation, housing, business, etc.). Students have their projects available and will have their creations emailed to them. Co.Ed. Recommended program length: 8 Weeks. Program Frequency, One session per Week. Ages 3-6, ideal for JK-Grade 1.